Are you interested in fostering diverse community connections, exploring new perspectives, taping into our collective wisdom to learn about what climate equity means for Portlanders? 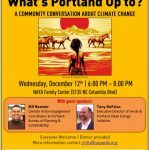 If yes, join the December conversation-With an introduction by Portland’s Climate Action Coordinator and by Verde’s Director on the Clean Energy Initiative. Contact us to participate!